"An Ode to Mat Burns and Pimples. Oh, how I miss thee..."
You're going to have to pardon my digression this time out. I simply can't tell the story of this movie without revealing some of its impact on my own personal story. Part of what makes movies so special is their ability to transport us. Not just by means of suspension of disbelief or outright fantasy, but their power to send us to a specific moment in time. The images and setting might remind you of a bygone era of your life, or maybe even the memory of seeing the movie itself might crop up in your brain, the synapses popping away, meriting a faint smile. As a movie fan, this is, in fact, how I mark the passage of time. I can immediately associate nearly every movie I've seen with a specific moment in my life. The equations come much easier than those multiplication tables I supposedly memorized so many eons ago. "The Goonies" equals endless re-enactments of the waterslide/pirate ship discovery with my friends at the local pool (for the record, I was 'Mouth'). "Dune" equals walking the dog with my brother afterwards, and after running up ahead and hiding in the bushes to scare him a half dozen times, (deservedly) getting my nose broken on the 7th go around by one of my brother's wildly flailing, terrified limbs. "Pet Sematary" equals standing in a completely empty parking lot with my friends, waiting for my mom to come pick us up, certain that 'Zelda' was going to pop out, leaving a pile of 14 year old heart attack victims in her freaky, boney wake. "Born on the 4th of July" inexplicably equals making out with my girlfriend at the time in the back of the theater. And a viewing of "Vision Quest" invariably equals one of the most exciting, terrifying, and (not surprisingly) pimply chapters of my life. During it's initial theatrical release, "Vision Quest" had almost no impact on me, as I was only eleven in 1985, and it was rated 'R'. Vague memories of Madonna's "Crazy For You" playing at junior high dances while I robotically swayed with my "date" at arm's length were the only blips on my 'culture radar' at that time. But a mere three years later it was destined to play a part in my life. In 1988, I was a freshman on the varsity wrestling team. I had wrestled all through junior high with quite a bit of success, if I may say so my damn self. I was a big kid for my age, and the other kids in the 11 to 13 year age bracket simply hadn't caught up. 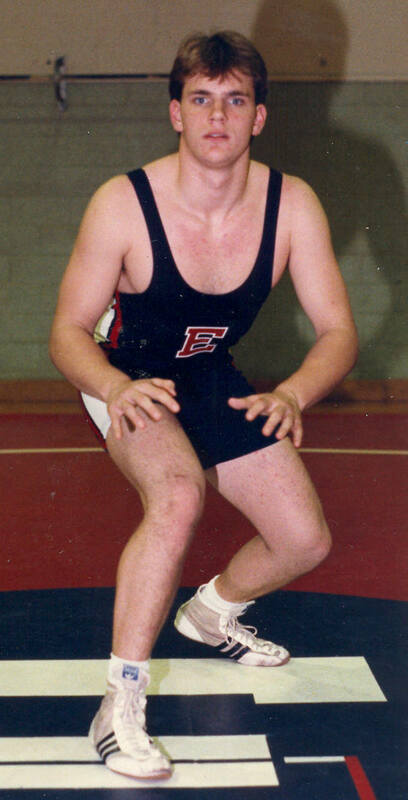 So when I started high school in 1988, I naturally went out for the wrestling team. And through a combination of luck and some natural ability, I managed to wrestle my way to a spot on the varsity squad my freshman year. I look back on it fondly now, but to be honest, I was absolutely terrified. While I may have looked mature as a 189 lb. fourteen year old, I wasn't that far removed from playing with GI Joe's and Matchbox cars. And now here I was mixing it up with essentially full-grown men. These dudes drove cars and shaved! I wasn't allowed out past 10 pm! At any rate, the wrestling team was a close knit group. With basketball being a much more "fan friendly" sport during the winter season, we usually had our meets in a nearly empty gym (save for our parents, who screamed nervous encouragement from the stands, and, oddly enough, a cheerleading squad. Who were they "leading" in cheers? I have no idea...) So we as a team would support each other. Aside from the usual driving around town and going to the occasional party, sometimes we'd hang out and watch a movie. It's a time honored tradition for teams to watch a movie to "psych them up". Since 1986, nary a basketball team on the planet Earth has let a season pass without viewing "Hoosiers" at least once. The baseball team has "The Natural" or "Major League" to stoke their competitive fires. "Rudy" for the football squad. "Slapshot" for the hockey team. And while the other sports had more famous and generally beloved examples of corresponding representatives in cinema, the wrestling team had a bizarre little movie named "Vision Quest" to call their own. Louden Swain (Modine) is an atypical high school student. He's the philosophical jock, a pretty rare breed in this neck of Spokane, Washington. And he's on a personal quest (a 'VISION' quest, if you will...) to challenge himself, and during his senior year he has decided to forego just the glory of victory on the wrestling mat and aims for the big prize: Shute. Brian Shute, the biggest, meanest wrestler in all the state. He's the best there is in the 168 weight class, and Louden makes it his goal in life to drop the necessary 22 pounds off his already lean frame in order to wrestle him. Everyone thinks he's nuts, and Louden can't really mitigate their charges. It's just something he HAS to do, and he goes about his quest (his 'VISION' quest, right?) with endless determination. But what's the ONE thing that can derail a teenage boy's goal of wrestling the toughest dude in the state? Why, his libido of course, and it's put to the test by a tough-as-nails artist chick named Carla (Fiorentino) who happens to come rambling into town and into his life during his quest (his 'VISION', uh... sorry... I'll stop...). So like those Reese's Peanut Butter Cup commercials from so long ago, they got their 'Tepid Romantic Subplot' in my 'Wrestling Psyche Up' movie! This is what keeps "Vision Quest" out of the vaunted halls of all-time great high school sports movies. The plot is split between Louden's exploits on the mats and his ongoing crush on Carla, so it's very uneven. But plot problems aside, it's the dialogue that truly derails this sucker, particularly the stuff coming out of Linda Fiorentino's mouth. Everyone involved gets some goofy stuff to say, but I can't even watch some of her scenes without getting sympathy embarrassment chills down my spine for her. She must cringe now when she sees some of her sneering tough-girl pronouncements. The whole thing would totally unravel if it weren't for three fantastic strong points. First is the music. Call me a sucker, but nothing says teenage angst like "Journey" and "John Waite". This soundtrack is a bastion of 80's goodness that also includes Sammy Hagar, REO Speedwagon, Berlin, and Foreigner, all doing what they do best (which is "ROCKIN'! ", in case you didn't know). And The Material Girl herself makes her big screen debut in this one. Madonna's "Crazy For You" gets plenty of screentime as the "romantic theme". But it's Red Rider's somewhat pedestrian yet vaguely rockin' "Lunatic Fringe" that made the most impact on me and my wrestling cronies. It's stripped down syntho beginning gives way to a kind of tripping guitar riff that underscores all of Louden's introspective wrestling moments, and it eventually became our team's "theme song", the soundtrack to our warm-ups before every match. Every time I hear it, I get chills. But in the end the film's biggest strengths are it's wrestling sequences and, of course, it's star, Matthew Modine. The wrestling footage both in the gym and at the meets is spot on, even down to the coach's whistle. The tenor of the scenes off the mat are just right as well and the credit for that has to go to Modine. He plays the introspective but gregarious Louden with a light touch. At no point during the movie do you believe the (at the time) 26-year-old Modine is anything but an 18-year-old kid trying to figure out what he wants in life. In the end, the biggest compliment that I can pay his performance is, there wasn't a teenage wrestler alive that didn't want to BE Louden Swain. He's about as cool as a kid wearing a singlet can be. The practice footage alone makes me break out in a cold sweat, phantom mat burns raising themselves on my knees. Not only were the drills accurate, they eventually became the guide for some of our own private torture sessions during those long winter afternoons. From indian runs to that goofy looking 'crab walk' across the mat to those seemingly physic-defying 2-man sit-up drills... we did them all! And the actual dual meet sequences were picture perfect. At first glance, wrestling may seem like a team sport, but in reality it's not. Just you and the other guy on the mat, and the movie manages to communicate the nervousness and mental struggle that come with that kind of physical pursuit. While all of the wrestling matches had to be choreographed to some degree, it certainly doesn't look fake at any point. The edge of your seat 'Big Match Finale' between Louden and Shute is on par with just about any other big sports movie ending I can think of. Also dead on was the other struggle that just about every kid on a wrestling team must deal with: making weight. Ice water lunches and hours in the rubber suit were par for the course back in my '189' days. The movie stops just short of some of the dirty little secrets that plague making weight in high school wrestling (diuretics or purging are never explicitly mentioned), but the physical toll is definitely shown. I can only thank God that I went up to heavyweight my sophomore year. In my mind, the only misstep was the scene showing the unusual training technique of Louden's nemesis, Shute. And believe me, you'll know it when you see it. But I'm almost willing to overlook it due to it's "badass" factor. It's just about iconic enough to render the logistical nightmares (how'd he get that log to the stadium? I sure hope he doesn't trip!) moot. Hindsight is 20/20. No doubt about it. There's no denying the sheer terror that I felt getting onto that mat every week to wrestle whichever pituitary nightmare the other team sent out for the 189 weight class in the winter of 1988. And while the anxiety lessened with every passing year, I was still a mental and physical wreck during wrestling season. And like me in '88, "Vision Quest" is a bit of a wreck too. The dialogue is laugh out loud ridiculous in spots, and Matthew Modine is just about the ONLY thing that's aged well from this movie. The clothes, hair, and music are like a 1985 time capsule. But I can't help looking back on it with fondness. Even when I watch it today, there's an earnest quality to it, and it makes all the anxious memories of that time melt away. For all its eccentricities (and, yes, that's the nice way of putting it), it's still a great snapshot of high school wrestling, and a great reminder of a strange time in my life. No snickering at my singlet!